Buying an entry-level or mid-range device is a tricky task. Although you need to check the cost-to-feature ratio, it is equally important to gauge the developer support and updates a device is likely to receive. While various manufacturers tend to shy away from updating their devices, Xiaomi plays a different game altogether. 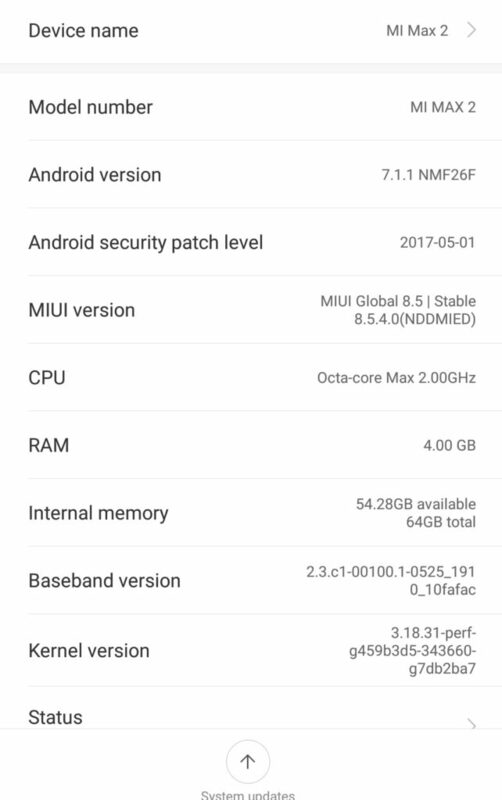 Xiaomi has recently been pushing MIUI 8.5 updates for Redmi 4A and 3S Prime and now, the Chinese manufacturer has unveiled Global Stable ROM V8.5 for the Mi Max 2.The update, carrying the build number V8.5.4.0.NDDMIED, updates your device to Android 7.1.1 Nougat and weighs in at 1.5GB for the flashable zip file and 1.7GB for the fastboot tgz file, both of which are included down below. Since this is a Global Release, Xiaomi has not provided us with a changelog. Furthermore, the build carries the May security patch which may come as a disappointment to many. This method is exclusively for Unlocked Bootloaders. In case your bootloader is locked, refer to the guide here to unlock your Mi Max 2. Click on the first button (circled out in yellow) to Refresh, and MiFlash should automatically recognize the device. Though the guide is simple enough, there are always chances of something going wrong. In case you get stuck or your device enters a bootloop, download the Mi PC Suit to restore your device.